The modern, high quality design enables the eMotion-14000 to push the envelope in performance, efficiency and safety. Another application of the Rexroth eMotion 1500 platform. Complementing the Virtual Reality rally visuals with actual movements, the platform provides an extremely realistic experience, as if you would be driving in the real world. 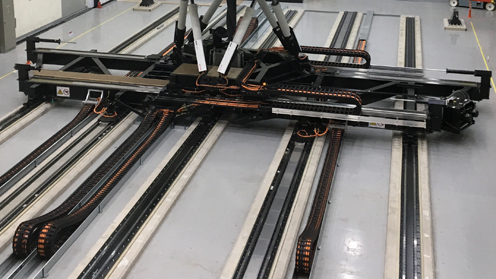 Based on electrically driven linear servo actuators, Rexroth XY platforms form a reliable basis for driving simulators. In motion simulation, Rexroth offers electrically driven 3dof and 6dof motion platforms as well as XY table solutions. The 6dof platforms, eMotion-1500, eMotion-2700 and eMotion-6000 are designed for today’s middle payload range in the electric driven motion systems product line. 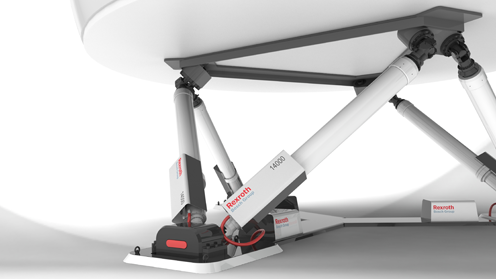 The hydraulic 3dof platforms, cMotion-16500 and cMotion-33000, are used for Cabin Emergency Evacuation Trainers (CEET's). The proven in-practice design is a synergy of our Drive and Control skills and profound application knowledge. Please get in contact with Bosch Rexroth 3dof and 6dof motion platform specialists directly.